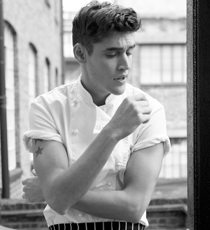 Chef-turned-model Isaac Carew has worked in kitchens with his dad and godfather since the age of eight, starting out as a Saturday boy picking spinach leaves and cleaning mussels. He went on to train at culinary school for two years and got his big break in 2007 cooking alongside Angela Hartnett at The Connaught and Cielo in Miami. Here the passion for homemade pasta grew. In 2008, Isaac was spotted outside Selfridges and approached to become a model. He has fronted major campaigns for the likes of Hermès, Moschino and Valentino and been photographed by Rankin and Nick Knight. In January 2016 the time was right to return to his culinary roots and Isaac launched The Dirty Dishes, a website dedicated to easy, delicious meals. His debut cookbook, The Dirty Dishes, published by Bluebird is out now. In the TV World, Isaac has appeared on Channel 4’s primetime show: Tried and Tasted: Ultimate Shopping List, working alongside Michel Roux Jnr as his right hand man, as well as a number of live cooking segments on This Morning.